KISS frontman Paul Stanley kicked off 2015 by delivering a pair of KISS classics with the Foo Fighters as that group marked Dave Grohl’s birthday with a last-minute show at The Forum in Los Angeles on January 10. 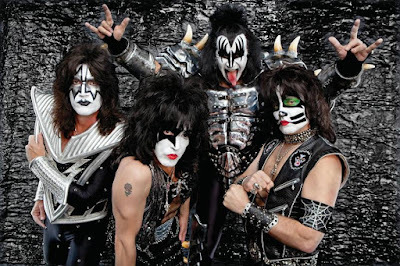 In late January, KISS released a new single with Japanese Idol pop band Momoiro Clover Z; a week later, they played a tour of Japan as part of the continuation of the band’s 2014 40th Anniversary World Tour. April shows followed in South America concert ahead of a three-week European run in late May. In mid-March, Twisted Sister frontman Dee Snider slammed KISS for its reuse of original makeup by non-original band members Tommy Thayer and Eric Singer. Thayer dresses in original lead guitarist Ace Frehley’s makeup and stage outfits while Singer does the same with original drummer Peter Criss’ gear, while each perform songs by their original counterparts. April saw Stanley and Gene Simmons honored with the ASCAP Founders Award at the 32nd annual ASCAP Pop Music Awards in Hollywood. KISS members voiced their own characters for the project, which centers on a Halloween concert at the group's amusement park Kiss World. Stanley debuted his new soul tribute band, Soul Station, at The Roxy in West Hollywood in September before KISS wrapped up their 2015 live schedule with shows in Australia and New Zealand in October. The group hosted the 5th annual KISS Kruise in late fall, a trip that saw them perform 1975’s “Alive!” in its entirety. Just a handful of 2016 concert dates have been announced by the band so far, with more expected to be added in the coming months.